You can bring a healing change, into your own heart and from your heart into our world. That is part of your destiny. We are designed to do it. You have the power and wisdom to open your heart, because you choose it. In part 1 of Opening the World’s Heart you moved into the Opening the World’s Heart meditation and experienced the beauty, majesty and power of the stream of love. You joined a stream of energy Opening The Worlds Heart to healing, love, compassion, beauty and connection. 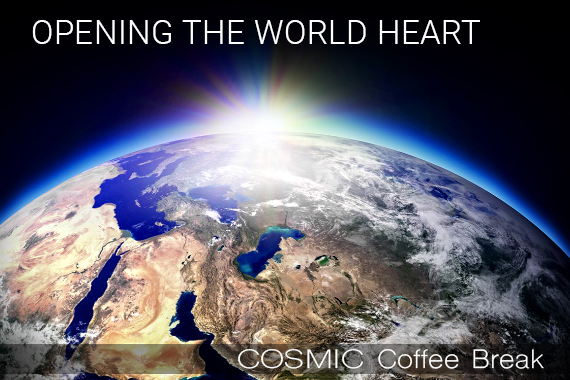 In this episode of the Cosmic Coffee Break, Opening The World’s Heart part 2, Lumari shares the Opening the World’s Heart PRACTICE, that allows your open-hearted awareness to show you which simple actions you can take to share the blessings of this world. These are not random acts of kindness. These are deliberate actions to open your own heart and share the blessings of life. Let’s all take actions to share our caring and generosity whenever the moment arises. And please share this meditation. That’s one action you can take right now. You will be delighted and moved with how this meditation can shift your life and our world.